The SS-N-27 Sizzler or 3M-54 Klub missile is designed to destroy submarine and surface vessels, but also has the capability to engage static or slow moving ground targets. 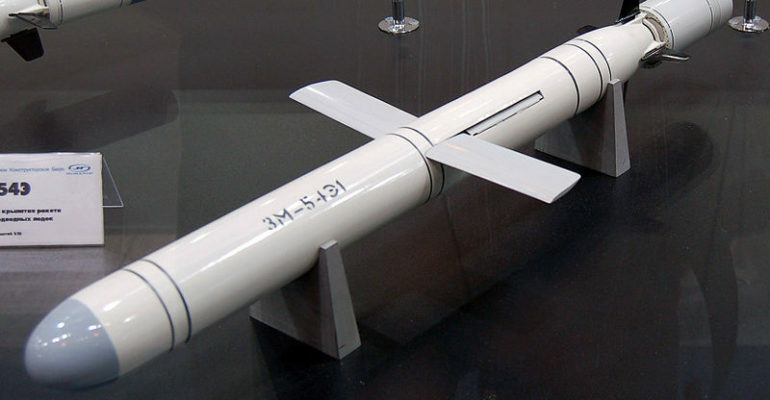 There are two modifications to this missile known to be used by the Russian military. The Klub-S for submarines and the Klub-N for surface vessels. The difference between the two modifications being the design of the missile launchers and transport containers. The Sizzler has a max range of 300 km, travelling 10-15 m above the surface at high subsonic speeds. Perhaps the most effective feature of the Sizzler is during its third solid-fuel stage where it accelerates to supersonic speeds; increasing the difficulty associated with missile defense intercept. Another advantage is the Sizzler’s size, just under 2000 kg, which allows it to be deployed onto most naval ships in large quantities. The Sizzler’s high cruising speed during its final stage and the missile’s advanced guidance system make it an effective weapon of choice for the Russian Navy. The Sizzler gives targets less time to react to potential threats. Theoretically, it can avoid most modern air and missile defense sensors due to its low-cruising altitude. Moreover, the missile’s supersonic third stage enables it to evade some air and missile defense interceptors. It’s small size also provides tactical opportunities in that it can deploy in bulk and employed operationally on board small naval ships or submarines. Along with its ship and submarine launched variants, the Sizzler can also fit into shipping containers, which allows for easy transport and makes it easier for the missile to avoid detection. The main concern for the United States and its allies is that the sizzler strengthens Russian operational superiority within its A2/AD zones, allowing Moscow to continue operating unopposed in regions around its own borders. Russia has also sold the Sizzler to countries around the world including India.